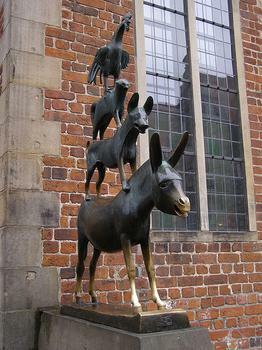 Die Bremer Stadtmusikanten or Town Musicians of Bremen is a bronze sculpture based on the eponymous fairytale by Brothers Grimm. Die Bremer Stadtmusikanten or Town Musicians of Bremen is a bronze sculpture based on the eponymous fairytale by Brothers Grimm. Located in front of the Town Hall, it depicts a rooster standing on a cat atop a dog on a donkey.